To lead in the implementation of the Comprehensive Agrarian Reform Program (CARP) through Land Tenure Improvement (LTI), Agrarian Justice and Coordinated delivery of essential Support Services to client beneficiaries. To implement, facilitate and coordinate the delivery of support services to ARBs through Social Infrastructure and Local Capability Building (SILCAB); Sustainable Agribusiness and Rural Enterprise Development (SARED); and Access Facilitation and Enhancement Services (AFAES). DAR is the lead government agency that holds and implements comprehensive and genuine agrarian reform which actualizes equitable land distribution, ownership, agricultural productivity, and tenurial security for, of and with the tillers of the land towards the improvement of their quality of life. A just, safe and equitable society that upholds the rights of tillers to own, control, secure, cultivate and enhance their agricultural lands, improve their quality of life towards rural development and national industrialization. The logo shows the department's acronym representing the institution and its role as the lead agency in the implementation of the Comprehensive Agrarian Reform Program (CARP). The sun radiates its light into the field of green divided into 12 segments representing the original 12 regions covered by the program. Green stands for fertility and productivity while yellow represents hope and a golden harvest of agrarian reform beneficiaries who are the recipients of the services provided by department via CARP. Both colors imply the economic growth and sound rural development can be achieved through agrarian reform. 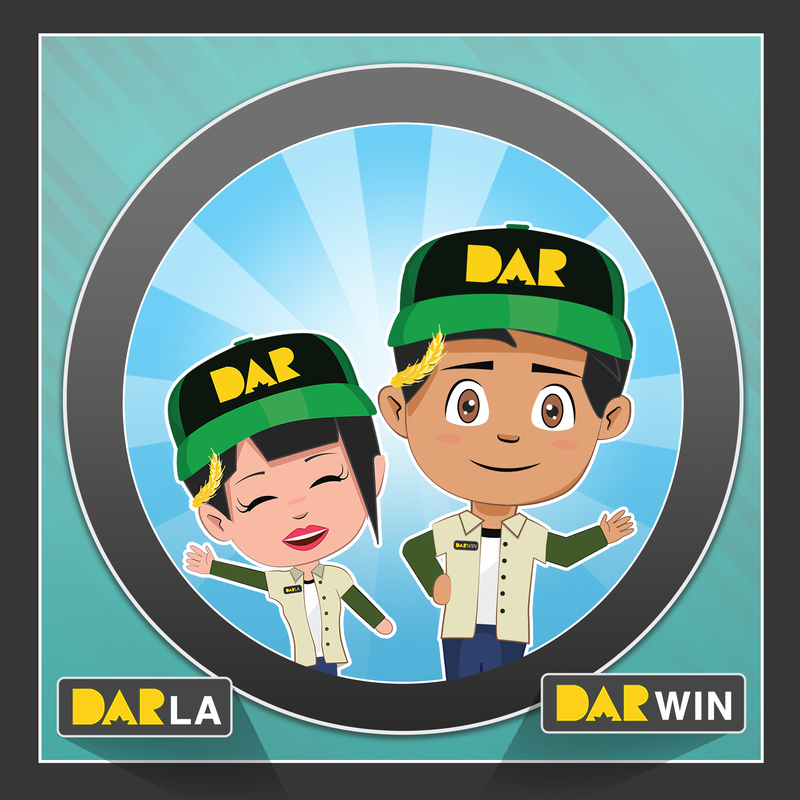 The Department of Agrarian Reform’s mascots are Darwin and Darla. They are two frontline service workers of the agency who are tasked to communicate the messages of DAR to its farmer-beneficiaries and the rest of the Filipinos. They represent the thousands of employees across the nation who are of service to the landless farmers. The couple usually sports a baseball cap, unbuttoned shirts over long-sleeved tees, and a pair of boots. But they are never seen without a stalk of rice grains pinned on their ears, a reminder of their commitment to serve the agrarian reform beneficiaries.